Los Tacos Locos is a taco stand located on NE 134th St. in Vancouver, Washington. It's connected to the side of a convenience store. This post will cover two visits I made to this place in mid-May. A couple of my co-workers told me about this place and suggested that I try it out. I had another one of those lovely burrito cravings a few weeks ago, so it was the perfect time to visit. It's a rather standard menu, with three burrito sizes (regular, supreme, and Loco), tacos, tortas, and quesadillas. I also found it interesting that this place serves gyros. There's even a spit near the grill, holding a large amount of meat. It might be just lamb on there (as opposed to a lamb-beef blend), although I never asked. Gyros at a Mexican food spot? I ordered the Locos burrito with carnitas ($6.25). I nixed the sour cream, but got all the other lovely fillings: choice of meat, rice, beans, cheese, lettuce, pico de gallo, guacamole, red salsa, and green salsa. I loved the quality of the ingredients. Fresh ingredients. The carnitas was juicy and tender. Perfectly cooked rice. Great job on the refried beans. Everything is made to order, so I got to watch the cook making my burrito. They don't skimp on the fillings, and frankly, the tortilla tore and ultimately failed to contain everything. Naturally, I didn't care and just kept wolfing my burrito down. For $6.25, this locos burrito should be a filling meal for many people. Still, a side of me wants an even larger burrito option. According to the menu, you can get extra rice, beans, sour cream, and/or guacamole for 50 cents each. Extra meat or fish is $1 more, and extra shrimp is $2 more. Protein choices include steak, chicken, fish, chorizo, shrimp, carnitas, lamb, and pork. 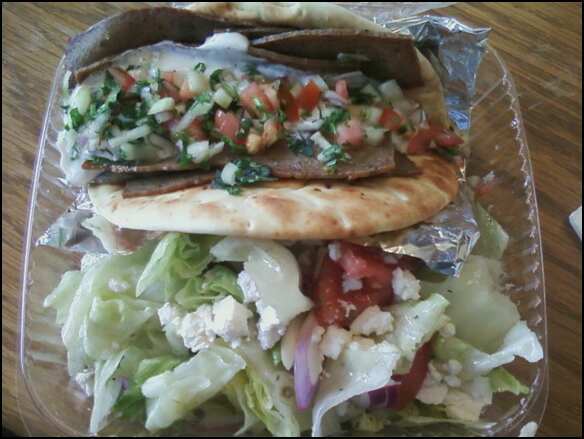 On my second visit, I decided to finally try the gyro and salad combo ($7.50). 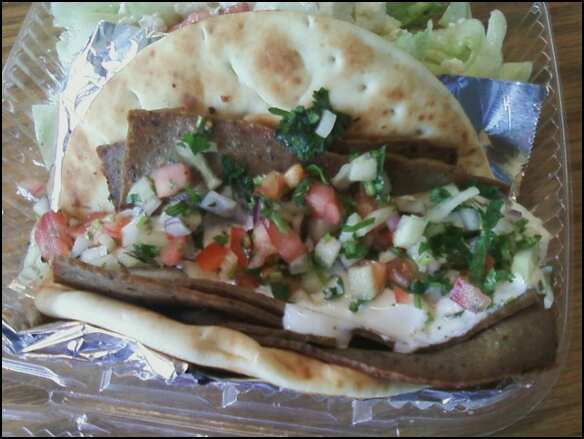 A thick, Greek pita is heated on the flattop, with uniform strips of meat (probably lamb or lamb-beef mix). Tzatziki is added, along with some pico de gallo. That pico de gallo provided a nice twist to the traditional gyro, and it still made sense. The side salad is basically lettuce, tomatoes, sliced onions, and feta with some Italian dressing. Frankly, I was disappointed that the spit (with all that succulent meat rotating on it) is right by the grill and no meat was taken from there to put on the gyro. Instead, it's looked like store-bought strips of meat heated and placed in the gyro. The service was also subpar this time. The two people working the grill and the register didn't appear to have much clue on what was going on. There was also a point in the service where both disappeared to the back, leaving the front unattended for at least a minute. It seems short, but it's a minute too long. I also noticed a woman at the counter basically getting ignored for a bit while the two employees tended to other orders. A simple "we'll be with you in a second" goes a long way. I suspect a strong language barrier played a major factor, but that shouldn't be an excuse. I rarely made note of it in the past because I haven't seen it happen in a long time. Unfortunately, such experiences still exist. On my first visit, I saw people in front of me ordering some mouth-watering tacos and quesadillas. The latter really sounds good to me, especially when adding meat to that.